Many public transportation systems lack of tools to control and manage their operations and be able to provide passengers with a pleasant experience. With our public transportation solutions, entities will experience increased productivity, improved dispatching, increased security, reduced operations costs, but most importantly, passengers will start seeing the reliability of their public transportation system and increase ridership. Passengers will notice the increased reliability of the entity’s public system, which will increase ridership, and a better transportation experience. Passengers will make more use of public transportation services. The true reason for implementing our solutions is for the benefits of passengers. Building a consistent public transportation system where passengers can trust its reliability will result in increased ridership. Passengers will get tons of benefits related to their finances, time management, among others. by living with one less car. ake control of your operations. With our series of fleet management tools tasks will take half the time to get done. You will be able to monitor closely all public vehicles and drivers, making sure they arrive on time at every stop. These benefits applies to activity on the road, but also in house at your dispatching centers. Over 30 Hours per week can be saved thanks to the automation of operations. We are fleet management that goes beyond vehicle tracking. You will see how your dispatching operations of your fleet of public vehicles benefit tremendously from our scheduling and routing solutions. A reliable public transportation system is all about how well organized it is and how efficiently it runs. Our scheduling and routing tools will help your dispatchers setup automated processes that will increase the reliability of your processes, and monitor activity specific to the public vehicles’ routes so they can make sure all operations are running on time and delivering passengers a great riding experience. Over 30% increase in ridership can be achieved through proper dispatching and an efficient public transportation service. Provide security for passengers, people on the road, and drivers. We give you Real-Time GPS Tracking and Monitoring (the tools), but it is your responsibility to use them in pro of a better public system and safer roads. Excessive speeding, unpleasant in-cabin situations, robbery, lack of maintenance, late driver attendance, among others, are things every entity want to avoid. With our real-time/live monitoring tools and reports, we let you control every single activity all the way from speeding to driver behaviors. 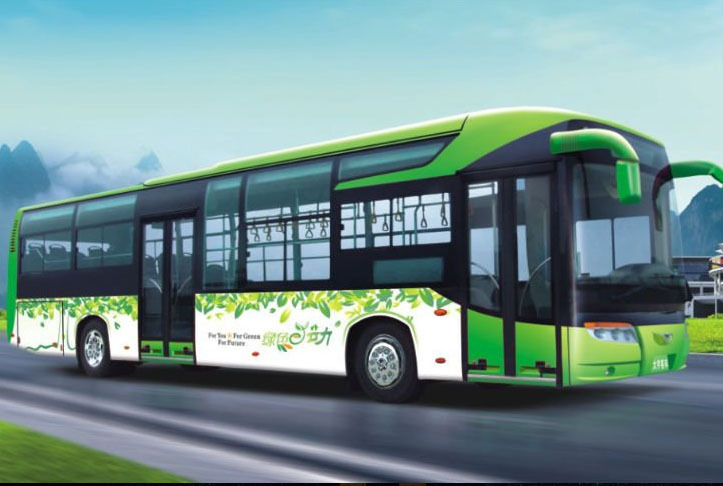 Your fleet of public vehicles will be a secure one and this will serve as a plus that categorize your entity at a high level service compared to others. Lower operational costs and use those savings for improvement. Your entity can be saving thousands of dollars from cutting down on costs coming from operations, employees, drivers, maintenance, fuel consumption, and more. Saving money in employees (drivers specifically) comes from our driver behavior monitoring tools, and other features such as monitoring real worked hours through accurate time sheet reports pulled from the vehicle’s activity, among others. With the maintenance module in our fleet management platform you will never miss a maintenance task again. Automated maintenance management tools will help keep a close eye on upcoming maintenances, being able to always do them on time. Fuel consumption is probably the major factor when it comes to saving money. Monitoring events that affect fuel consumption such as excessive speeding and idling is key in the operations of any public transportation fleet. Over 10% reduction in costs annually can be achieved depending on the entity’s size, operations and goals. 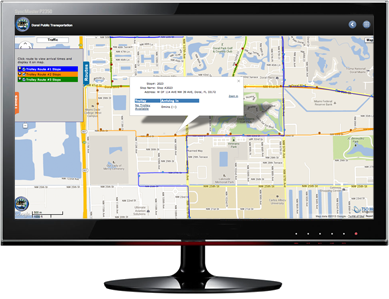 Our Mobile GPS Vehicle Tracking and Fleet Management solutions tailored for the public transportation industry, provide a high level of monitoring capabilities with up to the minute location information frequencies. Cities, counties, and any other entity with public transportation vehicles will be able to monitor and track in real-time while providing location information to the passengers. 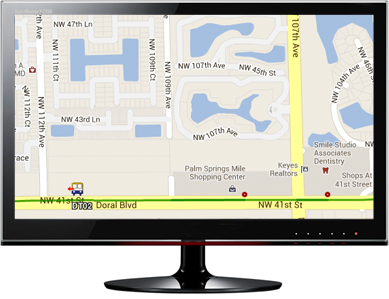 A wide variety of installation options for the GPS vehicle tracking devices are available. 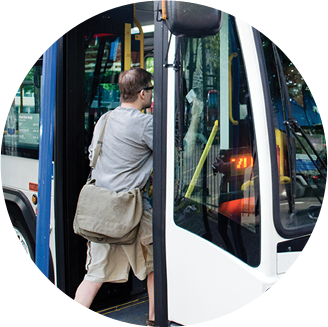 The focus and goal of our Public Transportation solutions is to provide entities with an advanced and reliable platform so they can provide passengers with an advanced and reliable transportation experience. This part of our Public Transportation solutions does exactly that! It gives entities access to a complete fleet management and dispatching platform where they can monitor public vehicles, their activities, key events that trigger automated alerts and much more to assure all operations are always running smoothly. a whole new public transportation and ridership experience. Passengers will have access to view in real-time the location of the public transportation vehicles (buses, trolleys, etc.). This information together with information about routes and other monitoring tools will help passengers improve their public transportation experience, trust its reliability and increase ridership. Passengers will avoid having to wait outside for long periods of time for late buses, trolleys, shuttles, and any other public vehicle. Our Real-Time GPS Vehicle Tracking Technology allows us to provide passengers with Estimated Times of Arrival (ETAs) to every stop in the public vehicle’s route. Not only can we provide ETAs by going into its routes database and reading locations, but also by identifying when vehicles are late because of any type of issue. This solution means a lot for passengers and it plays a big role when wanting to increase ridership. 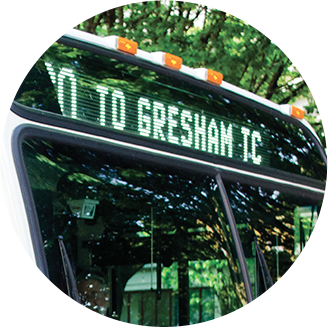 Passengers can see stops information such as routes the stop is part of, stops address, public vehicles that will pass by those stops, ETAs, and see all these information in a map. Passengers can see their current location in a map and pull up information about all vehicles’ stops near their current location. With this information the system will provide “walking routes” to the closest stop preferred by the passenger. Passengers can select the best route of a public vehicle according to their preferred stops interval. information about the whereabouts of public vehicles through voice or text. Our Automated Voice Information System (AVIS) and Automated Text Information System (ATIS) give passengers even more tools to use public transportation like never before. If they do not have access to a mobile app or computer, or if they need location or ETAs information quickly, they can simply dial or text a phone number. By dialing they will access a voice menu, and by text they will receive quick information about the public vehicle’s current location or ETA to the next stop. The Automated Passenger Counters (APCs) system monitors passengers coming in and out of the vehicles through all doorways. This is done with a pair of infrared (IR) light beams mounted horizontally across the doors. Passengers freely pass through the doors and break IR beams in sequence. This generates an entering or exiting count which is merged so it transmits a formatted message via RS232 serial link to the vehicle’s GPS Vehicle Tracking System. Wheelchair Ramp Deployed/Stowed (if equipped). Bicycle Rack Deployed/Stowed (if equipped). Each of these messages is received by the GPS or AVL system and merged with time/date and GPS coordinates. The merged APC data is then sent to the APC servers in real-time via a cellular connection. Entities will get total live control over in-cabin activity. 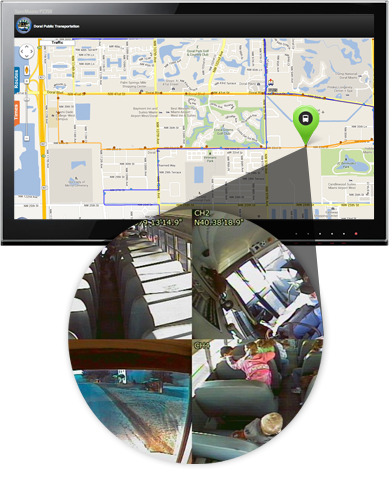 Live video monitoring is a very important addition to our solutions for Public Transportation Systems. Monitoring visually what happens inside of the public vehicles is key when it comes to providing a secure and reliable public service. Endless are the stories about unpleasant situations happening from either drivers or passengers. Drivers being rude to passengers, passengers not acting properly, drivers breaking behavioral policies that could affect routes performance and more, are situation that every public transportation entity needs to be aware of; Live video is the only solution that will provide a real high level of monitoring and control for these type of situations. UTS provides a series of easy to use live video monitoring software and hardware tools. Unlike many other video monitoring solutions, UTS Mobile’s is connected and synchronized to our Real-Time GPS Vehicle and Fleet Management system to be able to provided additional tools such as automated logging of activities, alerts, and much more. Additional to all the tools UTS Mobile makes available for passengers to improve their ridership experience, the LED signs and annunciators will improve their experience inside of the actual bus. Automated on-board visual and audio announcements will keep passengers up-to-date about the vehicle’s location, routes and upcoming stops. This is a great benefit for both visually impaired and hearing challenged passengers. UTS Mobile’s LED Signs and Annunciators are ADA compliant and dispatchers can gain remote access to configure what signs will display or announce. PIDs are extremely helpful for passengers due that they can be placed at every stop to provide real-time location information of the public vehicles, estimated times of arrival and departure, as well as information about late vehicles and why they are late. 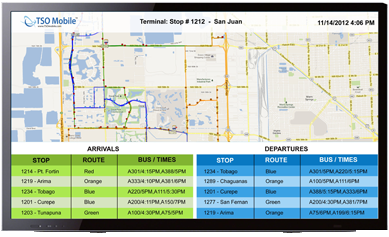 UTS Mobile’s Public Information Displays are all of our Public Transportation Solutions put together in one single screen. If the passengers do not have access to a computer or mobile device to track the public vehicles, view arrival forecast or call/text for automated information, they can see all of this information in the PIDs placed at every stop of the public vehicle’s route. Also, PIDs are great to generate revenue for the entity by placing advertisement and be able to use some of this income towards the automation and improvement of the Public Transportation system. On the other hand, they can also be used to provide passengers with important information about the city, school, hospital, amber alerts, and just about anything.